Herein we can discuss all aspects of Dungeon Crawl: Stone Soup. This is a spinoff from Ye Olde Roguelike Thread. 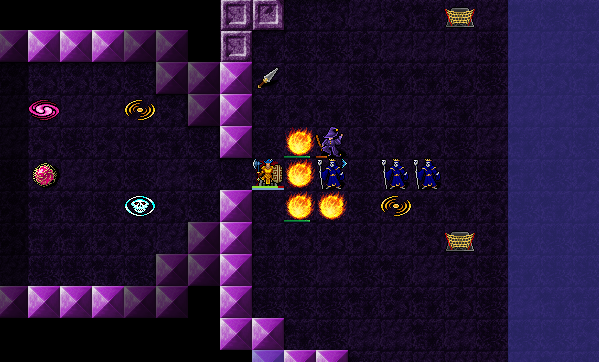 Dungeon Crawl Stone Soup is a free roguelike game of exploration and treasure-hunting in dungeons filled with dangerous and unfriendly monsters in a quest for the mystifyingly fabulous Orb of Zot. Dungeon Crawl Stone Soup has diverse species and many different character backgrounds to choose from, deep tactical game-play, sophisticated magic, religion and skill systems, and a grand variety of monsters to fight and run from, making each game unique and challenging. 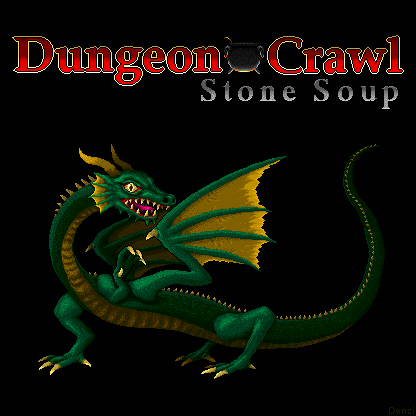 Dungeon Crawl Stone Soup can be played offline, or online on a public telnet/ssh server. These public servers allow you to meet other players’ ghosts, watch other people playing, and, in general, have a blast! Every new version of Crawl is celebrated with an online tournament. Games played using one of several online services will be counted toward your clan's total points. Banners! Achievements! Glory! Join the GWJ clans! Tournaments and new releases are about once every six months. We try to be very welcoming to new players and we don't have "competitive" teams. We're just here to help and encourage each other. We usually have enough players for several teams so you don't have worry about bumping someone. You can follow the well-written instructions laid out at the Crawl site. As long as you are part of a team, any games played on the main servers (most of us play on CSZO) will count toward your score total. The easiest way to play is in your browser using webtiles (the graphical version of online play) by following the links on the HowTo page. For console play on Windows you will need a SSH client like Putty. There are detailed Putty steps on the bottom of the page. If you are on Unix/Mac you can just SSH into one of the servers from a command prompt; there are instructions for that as well. The # sign is included. One webtiles you can use the "edit rc" link, on TTY you can just follow the prompts. Check out tboon's excellent post for a step-by-step guide. I created an account but can't play right now. I'm working on/coordinating a QA release/test/release cycle this weekend. I'll check it out soon. It's the perfect game to play at work while waiting for other stuff to happen. I mean, uh, not that I know that firsthand, I, uh, heard some people say that, yeah. I was waiting on a build so decided to give it a shot. I got down to level 3 as some kind of Dwarf Necro but couldn't figure out how to heal since they don't auto-heal. I tried all the potions and scrolls I found, but none were healing. I kinda forgot I chose Necro so never even looked to see if I had any spells. Oops. Right after I went down to level 2 I fell down to level 3. I immediately ran into what I think was a zombie centaur and he waxxed me. I was down to 4HP at that point. Definitely has that old-school Rogue feel with modern trappings. Learning the inputs will be the hardest part. This should help. I think it is still accurate for the latest version. It is pretty close, at least. They very seldom change this stuff. 1. Minotaur Berserker is a good early character. Start with an axe. If you get into trouble, berserk (hit 'aa') - realize that you need to be sure you kill everything that has seen you, the after effects of berserking will leave you slowed and unable to berserk for a little while. Duck around a corner and heal up (press '5' to wait/rest). When you get two pips of piety (look in the upper right hand of the screen for your piety) with Trog you get "Trog's Hand" which is the best ability Trog can give you: Regen + MR++. MR (magic resistance) is very important in the game, as a berserker, anytime you see anything that might hex you (orc wizrds for instance), press 'ab' and get a huge boost to MR, negating most of what they can do to you. Regen is always awesome as well. Later you get "Brothers in Arms" which summons a troll or ogre that will berserk and fight with you. Later still, Trog will gift you weapons (sometimes they are even useful). 2. If you play a melee character, you can get by with what is called "O-tabbing" - hit 'o' to autoexplore and 'tab' to auto attack. It helps speed up the early game where there is not a lot that is too scary. Just make sure to pay attention, things can go pear shaped in a hurry. 3. A lot of the stuff on the ground is garbage but always be on the lookout for upgrades to your equipment. Armor is very important. If you start as a Minotaur Berserker, you will want to get out of that animal skin as soon as you can. The hierarchy is robes/skins < leather < ring < scale < chain < plate < other stuff you can find out later. Generally, the heavier the armor the more protection it gives but it also penalizes you, making you miss more. Train Armor ('m' key to bring up skills) to mitigate these penalties (you also need to be strong enough to wear it, check out the "endurance rating" - this needs to be <= your strength). 4. Tons of other stuff. If you have questions please ask. The game is very deep and complex. Edit edit: I skimmed this - Michael, you broke your ankle?!? Man, I am sorry to hear that, I hope it is not too bad and you make a speedy recovery! I've also heard - from a friend of a friend - that if your work has a web blocker it usually won't catch the SSH connection via Putty or a chrome shell to play via console. Though I would certainly not do that myself during lunchtime or while I'm waiting for tests to run. And yes, thanks for the kind thoughts to all - just a small fracture in one of the bones of my foot after the harsh mistress gravity had her way with me. 6-8 weeks on crutches and a boot. But for right now I have the weekend off and plenty of couch time for Hollow Knight and Crawl. What's are the keystrokes for finding, drawing a path to, and cycling through stairs down/stairs up that you aren't near? X to go into full-map exploration mode. < or > to cycle through the up or down stairs, respectively. [ or ] to peek at the floor above or below, respectively. If your cursor is currently on a stair, then your cursor will be placed on the equivalent stair on the other floor, if you've seen it already. And then hit Return to go to the tile you've selected. 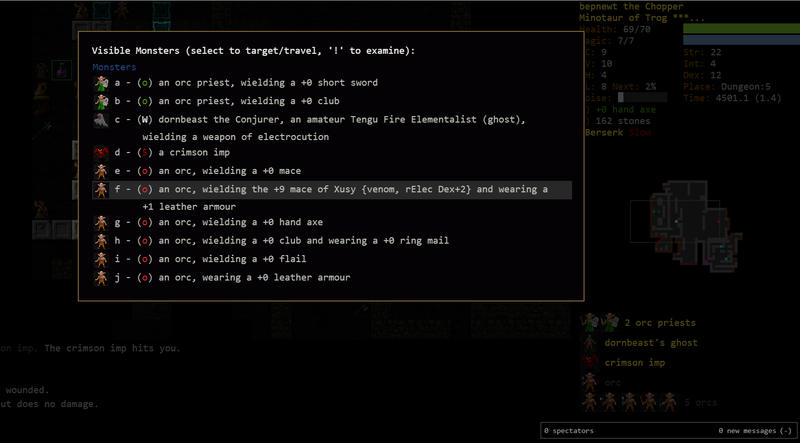 I'm level 5, on level 4 of the dungeon, doing very well and just put on some cursed armor. It was glowing, what choice did I have? I _had_ to try it on! Do I just start over? I'm doing the Minotaur Berserker thing and have a buttload of scrolls and potions that I don't what they are. I haven't tried any of them. Nevvvvvvermind. I hit the 'o' key and immediately ran into Dowan and Duvessa. I didn't last long. I could have tried to run to some stairs, but I figured since I had this cursed armor on anyway, I would fight them and at least see how tough they were. I got Dowan low on HP before I died. 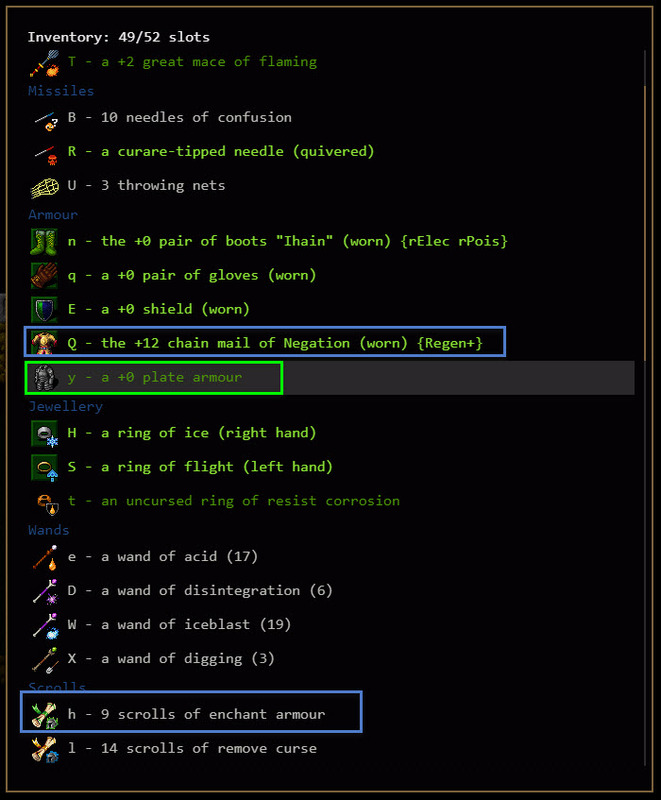 So when that happens you are stuck with whatever you put on until you read a "Remove Curse" scroll. People have different strategies for identifying scrolls - some people just read them as they get them, some people only read duplicates, some people wait until they reach the 4th level to read the dupes. Why the 4th level? This is the first level the Temple can show up on - if one of the scrolls you read is Magic Mapping, you can find where the Temple is and head toward it. The Temple contains altars for some of the gods in the game. Having a god is pretty important as they give you benefits (like with Trog). If you start as a berserker, you already have a god, so Temple is not important but if you play as another class it is important to start worshipping a god as soon as you can to get piety with them earlier and start reaping the god's benefits sooner. Regardless, reading unknown scrolls is mostly safe; there are a couple that can be dangerous, depending on the situation (Scroll of Noise will attract enemies, Scroll of Vulnerability will half your MR, etc.) but by and large, they are safe to read ID if you are not in sight of any monsters, especially scrolls you find early on. Quaff IDing potions, on the other hand, is dangerous, there are a lot more potions with negative effects. Also, potions are generally more powerful and less numerous than scrolls and so should be saved. Once you have some Scrolls of Identification, ID your potions using those. ...this one being particularly helpful in learning the ropes for me. He's a good teacher with other builds as well. EDIT: I thought someone mentioned this before, but just in case, UV4 has a good crawl guide as well here. My apologies if I'm being repetitive, but I thought it was worth the risk. Anyone played with this before? Based on the description, it seems like it will reflect lots of stuff like spells and enchantments, but at 9 skill I'm at 0%. I'm tempted to try it, but I don't have a solid one-handed weapon yet. I also have a skill manual for shields, so it's cheap to dump some points in it to test it out. Wondering if it's worth the reduction to a one-hander. It sounds like it might be totally awesome at higher skill ratings. o - the +3 warlock's mirror . A handheld array of hexagonal mirrors, synthesized from a truly exotic substance and polished to a blinding sheen. A skilled user will find that it can reflect almost anything, even spells that pierce through lesser materials and hexes with no physical manifestation at all. With your current SH, it has a 0% chance to reflect enchantments and other normally unblockable effects. It reflects blocked things back in the direction they came from. Thanks for even more tips. I found the Temple area on level 4 and wasn't sure what to do there since I had a God. Looks like 'nothing' was the right choice. I'm on level 5 and am in an interesting spot. Lots of baddies near me - the orcs are in a room or something but I guess some of the walls are glass because I can see in and they can see me. I have a bad feeling this is not going to end well. Especially since I'm still using my starting +0 Hand Axe and have +0 Chain and a buckler for armor. Ultimately it's still a buckler. For the amount of skill you'd have to put in to make it worthwhile, you'd probably be better off with a shield or a large shield on a MiBe. Trog's Hand will give you MR++ whenever you need it. I'm on level 5 and am in an interesting spot. That's a player ghost vault, with some bonus monsters to fight. The doors are magically locked, meaning that only you, the player, can open it. I'd recommend not opening it now -- go get a bunch more experience, then come back later (like after Lair) to bust some ghosts. I died on Vault 1. Gosh, that was unexpected. I had grabbed the Spider rune and was doing pretty well. Then I got marked on Vault 1, and suddenly I wasn't doing very well. Still, I thought I had things under control when bang, I was dead. Funny how that happens. I expected to die, but just not there. I'm not sure I've ever died on Vault 1. Overall, I'm happy with my first run though. It's been a loooong while. Things are starting to come back some. Are there no more wands of healing or wands of hasting? I made it up the stairs with only 2 orcs as "companions". I lucked through the whole shebang and ended up surviving. Fun stuff. I'm now in Lair 2 and just found the entrance to The Shoals. I think I'll stay away from that for now. Edit: And now a staircase to the Snake Pit. I've been wearing a Ring of Flight for a while, now. How do I activate it when I want to fly? The only amulet I've found was one that let me regen magic faster. Crap-O. Those are gone, as of a couple of versions ago. Also scrolls of recharging are gone. On the up side, wands now auto-identify when you stand on them, and wand charges now merge together when you pick up a second one of the same type. "a" key to open your activations menu. That's also where your god abilities live. You'll only ever get two of those in a game -- (Swamp/Shoals) and (Snake/Spider). 1) Vaults 5 -- beware of even walking down to V:5 unless you're fully prepared, because there's an entry trap. 2) Abyss 3 -- the rune spawns only at A:3 or deeper, and there are no guaranteed exits out of the Abyss. 3) Slime 5 -- very slimy, difficult fights. I think I prefer Slime 5 as my third rune these days. I have absolutely no time right now but I feel like playing a bit anyway! Does any team still need a player? Alas, we have two teams of six at the moment. We have two filled teams of 6 right now, but bepnewt isn’t teamed up. We could perhaps restructure into three teams of 5,5,4, or you and bepnewt could start a third team? Are there any other veterans who could be lured out of retirement? I'm just dicking around and can't commit to anything. I'm sure it will be like most things and I'll move on after a short time. Don't count on me for any kind of team. On another note, I was on level 4 of Lair so pulled out after reading Merphle's post above and continued on in the Dungeon. I'm on D9 right now. Began as a Minotaur Berserker on Feb 8, 2019. Was the Champion of Trog. ... and 3 runes on Feb 10, 2019! The game lasted 03:15:55 (78475 turns). Won on my first MiBe attempt. Should I quit while I'm ahead? That’s a pants-changing moment, for sure. Congrats on the escape! Congrats, math! Nice work! That is most definitely a "stop and think" moment. How did you get out of it? No clue what those things are you killed, but they _look_ pretty dangerous. Grats! I picked up this +12 Chain armor of Negation on Lair 2. I just found some basic plate +0. I have 9 enchant armor scrolls. Should I ditch the chain and enchant the plate? I'm sure the regen is nice on the Chain, but I don't know what Negation is. I have seen messages where it say that my Chain armor and Shield made me miss an attack or something and that seemed weird. “Negation” is just a meaningless flavor word. All that matters is the Regen+, which is always nice, and the +9, which is a great enchant for an artifact. It’s a good set of armor to use up through the first rune or two, but on a MiBe, I’d eventually be looking to end up in Gold Dragon Scale armor, and blow 12 enchant armor scrolls on that. What’s your skill training look like? I switched skills to Maces because I found the 2 decent ones. I kept Axes going in case I found a nice one at some point. I don't know if that makes sense. I added Evocation because I had a buttload of wands, which I've now culled down to those 4. Again, no clue if I should do that. Edit: I just finished Lair 6 and found the entrance to the Slime Pits. I'm heading out and back to D:12. While maces and axes do cross-train, it’s rarely worth putting xp into both. IMHO, only train the one you’re actively using, and only train it up to the min delay skill level (which is listed on the item description page). You can set a skill training limit so it stops automatically. Also set a limit of 15 for Shields, for now. If you decide to stick with 1H weapon and a shield, which I generally recommend, then you’ll eventually want to upgrade to a large shield, which has a skill target of 25. Evocations training is fine. But of the 4 wands you’re carrying, it will only affect the Disintegration wand. It also affects the evocable misc items (lamp of fire, box of beasts, etc). Training it up to 8-12 is usually as far as I’d be inclined to go, unless I find myself relying heavily on the evocables. And usually only after I have my weapon and shield training done. Once weapon or shield finishes, then turn dodging back on. Once the other finishes, then turn evocations back on. It's actually much worse than it looks because my berserk had just worn off so I was slowed and unable to zerk again. Also I had the poor-eyesight malmutation. Basically after that picture I read a tele scroll, quaffed haste, and then either quaffed healing or attacked (the axe was +6 antimagic, so trying to get that to stick on the OoFs) until the tele went through. Got a lucky tele right up out of the lungs and picked all those guys of one/two-at-a-time after resting up.